Panel – Brian Norton, Josh Anderson, Belva Smith, and Wade Wingler – Q1- Closed captioning in the classroom Q2- Fixing a Perkins Brailler Q3- Jaws vs. NVDA showdown Q4- Battery Interrupters – where do I find the copper discs Q5- Adaptive Eating Utensils Q6- Text-to-speech app for person who is visually impaired Q7- Wildcard question: What type of tech do you bring on vacation with you and why? BRIAN NORTON: Hello and welcome to ATFAQ episode 86. My name is Brian Norton and I’m the host of the show. We are so happy that you’ve taken some time to tune in this week with us. We have a great lineup of assistive technology questions for you today, but before we jump in, I want to take a moment to go around the room and introduce the folks who are sitting here with me. First is Belva. BRIAN NORTON: But it is the team lead for our vision team here at Easter Seals Crossroads. We also have Josh. BRIAN NORTON: Josh is the manager of clinical assistive technology. We also have Wade. BRIAN NORTON: Wade is the VP of anything and everything here, lots of stuff under him. Assistive technology is his passion and love. Is that correct? WADE WINGLER: I grew up doing assistive technology around here. I can’t quit you. I can’t get away. BRIAN NORTON: We shackled you to our floor. BELVA SMITH: I remember a day when you set I’ll never stop going to see the consumers. BRIAN NORTON: Then he found out, making a bunch of “mini-me’s” really works well. WADE WINGLER: Or I could just get Brian to do it. And when Brian is busy, I’ll get Belva to do it. Hey Josh, guess what! BRIAN NORTON: Excellent. For those who are new, I want to talk a little bit about the show, how it works. 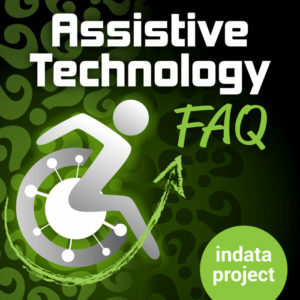 The first thing is we receive feedback and look for assistive technology questions throughout the week. And then we come up with a show. We start putting that together, format that into a show that will work for us. If you guys have questions, we have three ways for you to get a hold of us. The first is our listener line that is 317-721-7124. We also have an email address at tech@EasterSealsCrossroads.org. We also have a hashtag set up for Twitter, hashtag ATFAQ. Those are ways for us together questions and one of the many ways together questions, but those are the three ways we really like to get questions. But we also look for feedback, so as we go to the questions today, listen closely, jot down some notes. If you guys have some experience with the stuff we’re going to talk about, let us know. We would love to include some of your knowledge in the show. You can reach out to us through those ways as well to be able to provide feedback. If you have friends of yours who would like to learn more about the show as well and find the show, they can find us in a variety of ways. You can go to iTunes. You can send them to our website, ATFAQshow.com. You can also find us on stitcher, the Google play store, lots of different ways to find us. Spread the word. We would love to have not only you but new listeners as well. Thank you, again, for being a part of it. Before we jump into questions, we did get some feedback — or really it was an internal email from Belva saying, hey, we talked about this on the show before and I found something as a resource that might be helpful. I think a couple of shows back, we talked about GPS tracking devices or being able to do GPS tracking with your phone. Belva, you heard of something called Relay Go? BELVA SMITH: I think we’ve had this question a couple of times about how a person could know exactly the location of a family member or a friend. I think the last time it was how can we do it without having a phone. Recently, I heard about a new device that’s called Relay, R-E-L-A-Y. It comes in packs of two or four. They’re about the size of a half-dollar, rubber, they say their water resistant and you can drop them and step on them and they are okay. But in the center of them, they have to push button. What they are is like a walkie-talkie. For example, if you put the app on your phone and send your kids out the door with their plastic, rubbery retail devices, at any time that they want to contact you, all they have to do is push that center button, and like a walkie-talkie, the app will open up on your phone and they can communicate back and forth to you. That’s exciting, but also, at any time that you want to know where the kids are, you can pull it up on your phone and look at the GPS intelligently where they are. I heard about it and thought, this would be a great way not only for keeping track of the kids that even for grandma, because you can get one of the extra things that come with it is a thing to come around your neck. I wish they had a water type respin so that you can put it on your wrist. But even send it to a backpack or a jacket or something. It has a long battery life and is using a closed network connection. It says 4G LTE and Wi-Fi. The cost for the two devices is only $150. Monthly you pay $6.99. You can also play music on them, but I was just thinking this would be a great, easy way to keep track of grandma if she’s living at home alone and you are worried that maybe she’s going to go out and take a walk in go too far. You can always pull up the GPS and see exactly where she’s that. Also, it’s kind of like the iPhone and can’t get up. Push the button and you are automatically connected to whoever you are connect to with. BRIAN NORTON: The one person. BELVA SMITH: Right. It’s not like she’s going to be able to make endless phone calls or call her best friend or whatever. It is a closed network, so it’s not like your information is getting out there to others. Yeah, it seems to me like an easy, affordable check and device. BRIAN NORTON: There is no screen, so you don’t have to worry about your kids being stuck on their screens all day. BRIAN NORTON: That’s a really great safety type of device. I kind of like that. BELVA SMITH: $6.99 per month is not bad. But that is per relay. If you got two of them, then you would be paying $13. BRIAN NORTON: That is really cool. They also say it’s not for kids. It’s for outdoor enthusiasts, so if you are out hiking and need help, you have a button to be able to push. Is not as big or bulky as a phone or those kinds of things. For seniors, for team, if you are in and amongst the team and need to talk back and forth with each other quickly, you can do that as well. That’s pretty cool. I like that. The website for those, if you go to RelayGo.com, is where you can find them. That’s R-E-L-A-Y-G-O dot com. You can look it up to learn more information. That’s excellent information. BRIAN NORTON: Our first question is, I am an IT professional working for a large school district. I’ve got a question from the teacher the other day. He basically says, I have no idea how to answer. As one of the student’s accommodations, they are looking at using closed captioning to be provided. The district uses a computer program called iReady. It’s kind of a computer based learning program that includes embedded videos and other content, and the content doesn’t have close captioning for this particular individual. The question is, is there any way to provide closed captioning for embedded videos that designers have not built in. Just to jump in initially with this, we actually have all of hours — lots of our content transcribed. Full day trainings, we transcribe all of our podcast and lots of different things like that. We work with a couple of transcriptionist. I threw the question out to them to figure out what they might say about it. Essentially what they said is, at a cost, if they just wanted transcripts, they could do those. But the cost to do that postproduction captioning is about one dollar per minute for a caption to be able to do it. They are not sure if that something that is available within typically a school budget. That can get pretty expensive pretty quickly, as a lot of videos are 2 to 3 minutes long and there are several videos that need to be done, probably. It’s one dollar per minute to do postproduction captioning. They also mentioned they might be able to contact the maker of the video, maybe the folks from the computer based learning program, to kind of talk about their media to figure out if there is some way for them to do it and that they might not be complying with the ADA. She talked about scaring them into doing some things. That may or may not backfire on you, the scare tactic. Certainly contacting them and asking them if it’s something they can provide, if they thought about that, the accessibility of the video that they are putting out there. The other thing that they’ve done — she has seen done in school districts before — is probably the best method. In the school purchasing policies, for them to be able to put language in there that they don’t purchase items, particularly media, that isn’t close captioning, that doesn’t provide closed captioning. A lot of times they are seeing school district writing that policy in there to make sure that the accessibility pieces built into the stuff that they purchase upfront and they don’t find that it is not afterward. Just a couple of suggestions from an actual caption, transcription writer as far as some things to do. So there is postproduction options. There is contacting the manufacturer. But then also writing things into the school policies. That’s what I had. Belva, you said you had some stuff? BELVA SMITH: I would agree with the information you had, Brian. I think first I would contact the folks to see if they could incorporate that. But I found two websites — again along the lines of what you are saying, Brian, the transcription is going to be one dollar per minute, but it’s as they can convert the audio or video. I think they were specifically asking about the video. They say that they have a quick turnaround. They have top quality professionals doing the transcription and they also have customer support. That was Rev.com. BRIAN NORTON: These days, it’s become a real emphasis that material is accessible. WADE WINGLER: As I look at this question, I’m reading it a little bit differently. Maybe I’ve missed it. They are saying that they want to provide captioning for videos that the designers have not built in. Is it fair to assume that the stuff that comes with this iReady platform has caption built in, but it’s the stuff that the teachers are adding into it, the additional? WADE WINGLER: Right. I would be calling iReady and saying hey, the stuff that they are including is captioned. Asked them. I assume that they provide a level of support and training on the iReady product that helps the educators and school system put content into it. How do we do the captioning? My guess is other customers, other school systems who use the iReady are going to have dealt with this and they can at least say, here’s how one of the school district has done that. Maybe reach out to the manufacturer and say what our best practices or what kind of ideas you guys have. Because they have certainly run across it. If they are captioning the stuff they provide, they probably have suggestions on how to support schools and how they do it as well. It still not going to make it easy to do the transcript. You’re going to have to come up with a transcript and synchronize, but I would be leaning back on the manufacturer and saying what do you know about who is doing this well and how are they doing this. JOSH ANDERSON: While you’re waiting on that, you could always use Microsoft translator as a stopgap. It’s not going to be perfect. It’s not going to get everything perfectly because it is using AI, but it is free. BELVA SMITH: It can do video? JOSH ANDERSON: It’s not going to tell you what’s on the video, but anything it picks up will transcribe. Again, it is using AI, not a real transcriptionist, so it’s not going to be perfect. But maybe while you’re waiting on a good reply from iReady or as they work through things, getting you what you actually need. Captions is a pretty easy accommodation that should be built and. BRIAN NORTON: Microsoft translator, as you’ve mentioned. We’ve talked about that before on the show. It’s a really good in a pinch option for folks as it uses the AI to transcribe. It’s free. BELVA SMITH: I was going to say, and it is free. Especially in a pinch. BRIAN NORTON: Our second question is a person who has a Perkins Brailler. We’ll talk about what that is here in a minute. Someone had just gotten a call who had a Perkins Brailler, and it is jammed, and they’re looking for a place to have it repaired. Do we know of any places that would repair it? First off, for folks who aren’t blind or visually impaired, they may not even know what a Perkins Brailler. Anyone want to describe the for them? BRIAN NORTON: It’s about as simple as it gets. It looks like an old style typewriter. We had a couple here and that certainly the case. As far as where to get it repaired, the place I would send you is, if you go to Perkins.org, there is a place you can look up to where to send it for repairs. It’s as simple as that. BELVA SMITH: Perkins does have a repair/service site but you can go to. Of course, since they are the ones that actually make the Brailler, that would probably be a number one choice. I also found this later, not right away when we had the question. I found a place called, all one word, called EqualEyesVisionServices.com. They boast on their ability to repair the Perkins Brailler, even the classic one. For those of you that are familiar with the Perkins Brailler, for a wild they had tried to make it — I guess — lighter weight, because these are made out of heavy-duty metal. BRIAN NORTON: For the size of device it is, it has some have to it. BELVA SMITH: Yeah, it has weight to it. They switched and started making it out of a heavyweight but plastic, because there is no other way to say it. They did that for two years and went back to the metal because they just want lasting. They are saying that they can work on those too. They say they’ll make it work like brand-new for you for $125 as long as it is only minor parts that are necessary. Honestly, I don’t think there could be too much major that you would have to replace. One thing I didn’t to do is look up the price for a new one, but I’m think they are around $700. JOSH ANDERSON: Somewhere in there. BRIAN NORTON: I don’t know the cause of them. BELVA SMITH: If you could get it repaired for $125, it certainly would be worth repairing. I have plenty of clients that have been using the same one that they got back when they were in high school, so they’ve been using it for 20 years. They really do last forever. There is not a whole lot that can go wrong with them. WADE WINGLER: There almost $1000. BELVA SMITH: Are they really? JOSH ANDERSON: It even says on their website if you go to the repair service, it says, number one, 60 to 80 percent of broken braillers don’t need repaired. BELVA SMITH: They just need cleaned. JOSH ANDERSON: There is actually a video on how to clean it, oil it. BRIAN NORTON: They sell DIY kits as well. JOSH ANDERSON: As far as the cleaning. it says that you can even go through training to become a certified repair person. WADE WINGLER: You can become a technician and repair them. BRIAN NORTON: They offer a two-week course. At any time you can start the course and will teach you all the ins and outs of the Perkins Brailler. BELVA SMITH: That’s interesting information. JOSH ANDERSON: Wade, you haven’t gotten any certification in a while. BELVA SMITH: I want to be a certified braille repair person. WADE WINGLER: I know. And mostly they just need to be cleaned. You are going to be scrubbing braillers. BELVA SMITH: You are going to get at least two calls a year probably because they are so durable. JOSH ANDERSON: Just think how big your muscles will get by lifting those. WADE WINGLER: Exactly. Belva’s Braille Repairs. BRIAN NORTON: They did say it’s two weeks. You would think for a simple device does because it looks pretty simple from the outside. BELVA SMITH: But there some big stuff going on the inside. BRIAN NORTON: They say, in this particular class, you learn about the 700 pieces in the fine tuning skills required to repair. There is a whole lot going on. They do so that you can always ship it to Perkins and Perkins will fix it for you, but they say shipping can be anywhere from $50-$150 depending on where you are sending you from. It’s not always very cost-effective to be able to send it back to them. BELVA SMITH: I will say that those to ship with a dust cover. I would highly encourage anyone who has one to do use your dust cover, especially if you don’t use it every day. Obviously does is going to be a big enemy of this medium-size device. Some folks that I know will send it off every two years or so and have it cleaned and oiled just to keep it working well. BRIAN NORTON: Our next question is our app showdown question for the week. Are apps that we are going to talk a little bit about is JAWS, which is a screen reader, and NVDA, which is a screen reader as well. During the app showdown, we just talk about what are the differences, the cost, the features, options, environmental considerations for certain things if that’s applicable, those kinds of things. I just want to take a look at JAWS and NVDA and discuss those a little bit with folks. I’m looking over here at vision team specialist and manager of clinical AT, Josh and Belva, because they have quite a bit of experience with these particular products. JOSH ANDERSON: I’ll start just because Belva has much more information than me. JOSH ANDERSON: I would say if you go cost first, that’s the biggest difference you’re going to notice. NVDA is free and JAWS is about $1000. Belva, and my pretty close on that? JOSH ANDERSON: Ever take. That’s going to be your one big difference. You would ask then why would anyone use JAWS? Especially in a work environment, NVDA is open source, and no one — Wade can probably back me up on this — no one in an IT department likes the word open source being put on a network. WADE WINGLER: We like the cost. We are worried about the security. JOSH ANDERSON: Exactly. I can make a big difference. The other thing is JAWS is made by freedom scientific. NVDA, being open source, there is always that slim chance that they could just go away tomorrow and everything big completely gone. One of the other differences in costs, JAWS, your customer support when you buy it is free. When you call the manufacturer, ask questions, get support, help like that. With NVDA, it does cost for that support. It’s not too much — Belva, what did we find it was? BELVA SMITH: I don’t even remember. You pay basically for hours. You can buy one hour or 10 hours or 20 hours. I’m thinking it was $15. JOSH ANDERSON: It was in terrible. It used to be a lot more, I believe. BELVA SMITH: For a long time, there was no one you could call. But they’ve changed that because they’ve developed an actual, pretty large group of people that stay focused on this. First of all, let’s talk about what JAWS stands for. JAWS is really an acronym for Job Access With Speech. NVDA is an acronym for — I called in for years, Non Visual Desktop Access, but I call the application. Wade is the one that pointed out to me several years ago that it was access. That’s what NVDA stands for. NVDA was a project started by a young man named Michael Curran — I hope I’m saying his last name quickly — back in 2006. At that time, it was a shock to everyone that, you mean that there is a program very similar to the screen reader Window Eyes and JAWS that I’m using, yet it is free? A lot of people took interest in it at that time, but for lots of different reasons, they decided to stay with their mainstream screen reader, especially the folks who have jobs. As far as the differences in what I can do with NVDA or what I can do with JAWS, they are very similar because the minute that the folks at NVDA hear, hey, JAWS has just introduced convenient OCR. Well, we are going to get busy and make that part of our program as well. Or hey, they are using place markers on webpages. Okay, let’s get busy into that as well. Is one versus the other. They stay very close with their features, in my opinion. I recommend both. I recommend NVDA a lot of times — in fact, without going into too deep of detail, I have a consumer who, because she wasn’t working, [Vocational Rehabilitation] wasn’t able to purchase the JAWS screen reader for her. We started out using the NVDA screen reader. Within a few months of using NVDA, she found a job. Now we’ve got to use JAWS. I want you to know the transition to go from oozing NVDA to using JAWS was like nothing but of course, she was scared to death because she had no idea what to expect, having never used JAWS in her life, but the transition was so smooth that I don’t think she really realized that she was using a different screen reader. You do have different voices with one versus the other, and I will say my first experience with NVDA shocked me because it was awful with a voice. BRIAN NORTON: It’s gotten better, right? BELVA SMITH: It’s gotten way better. Some people even believe it has better voices than JAWS. For my real tech savvy people, they use both, because they will like the way that NVDA interacts with, for example, Excel. Some people really feel like the feedback that you get using NVDA in an Excel spreadsheet is much better than what it is with JAWS because JAWS tends to give you way too much information. Same thing with Outlook. Some people prefer the way that NVDA reads Outlook versus the way JAWS reads it. So for my real techie consumers, they do use both, whatever the preference is. Honestly, other than the price, I used to say it’s just got to be JAWS, but I don’t really feel that way anymore. Other than if we could just get it to where employers could feel comfortable with it, because honestly I don’t know any IT guy that’s going to say sure, put that open source program on our database where we are feeding hundreds of people information. Take my network down for a couple of days. That’s okay. BRIAN NORTON: We were talking earlier, and I didn’t know this. I do some JAWS a scripting. Scripting allows you to customize JAWS a little bit on some program that it’s not really familiar with our hasn’t — is not one of your mainstream programs. So like third-party database at work. Sometimes I can go in there and tweak it to make it faster and more efficient on particular screens. You guys were mentioning earlier that NVDA has scripts as well. Really, if scripting can be done in NVDA, it’s really just the hurdle of getting employers comfortable with an open source program. BELVA SMITH: Under the thing I’ve heard from a lot of users recently with updates, JAWS is constantly — I want to constantly, but they do frequent updates. Oftentimes those updates will break something else, so they don’t have the issue with NVDA. When the updates come, it’s just a smooth transition. Sometimes they don’t even recognize it. Oftentimes — I think Outlook was one of the programs that was majorly affected with one of the recent JAWS updates. People just started using their NVDA while they waited on JAWS — I didn’t say the name — to figure it out. The reason I didn’t say the name is because anybody who is using JAWS note that freedom scientific is really not freedom scientific anymore. They changed their name. BELVA SMITH: Yeah, they changed their name. And I’m old school so is going to take me a long time to get used to that. JOSH ANDERSON: Belva, do you know the difference between braille displays with them? I’ve used braille displays with JAWS quite a bit. I haven’t used them as much with NVDA. Is there a big difference? BELVA SMITH: Not really. Again, but 10 years ago, NVDA wasn’t as compatible. They had a very small list of displays that they would work with, but pretty much anymore their list is very comparable to what you’re going to get with JAWS. BRIAN NORTON: That’s great. The other thing that occurs to me is not only that open source piece but also, Josh, you mentioned the support piece as well. If something breaks, Freedom has a pretty robust opportunity to go and find information that network of folks. There are some listserv that I can send out questions to and get some answers to. BELVA SMITH: NVDA has some listserv as well. BRIAN NORTON: They do? Okay, good. BELVA SMITH: The only real difference, in my opinion, when it comes to tech support is, especially if you are a professional like Josh and myself, when you’re sitting with a consumer, something is not working, you can’t figure it out, you want to be able to immediately pick the phone up and call someone and get an answer. Even with NVDA, even though they do have the paid tech support, that’s not going to be an immediate pick the phone up. First of all, how are we paying for it? Who is paying for it? With JAWS, you know immediately, even though you might have to wait on hold for a few minutes before you get somebody online, at least you can pick the phone up, make that call, and hopefully get your problem resolved. I’ve never had to walk away from a JAWS tech support question where I didn’t have an answer before we hung the phone up. That’s a pretty powerful statement, because with other assistive technology, that is not the case. BRIAN NORTON: 24 hour turnaround. BELVA SMITH: 24 hours, 48 hours. JOSH ANDERSON: Please leave a message with a good time to call back. BRIAN NORTON: That’s great. That is a got the what I want from this type of segment. Just taking a look at the different apps. I know we all hear about different programs and things like that, but when you line them up together, we can understand them in a little bit more by going back and forth and figuring out what the differences are, cost-wise, feature-wise, and those kinds of things. That’s great information about JAWS and NVDA. Thank you, Belva, Josh, for doing that. BRIAN NORTON: Hey guys, I have a high schooler who wants to make a batch of battery interrupters for me. WADE WINGLER: Nicely done. He interrupted his battery of questions. BRIAN NORTON: I interrupted myself. He has a high school who wants to make a batch of battery interrupters for him. He wants to know how to use a soldering iron. I thought he would see if he could make some that might be more durable than the non solder ones. They use adhesive copper seats. My question is, does anyone know where I could buy copper discs. I’ve searched Amazon and RadioShack, but I think I might have the right search word because I’m not finding what I’m looking for. Question A is, does anyone know where I can find the copper discs made to make the battery interrupters. And the second question there is — there is no second question. BELVA SMITH: Can I make a question? I don’t even know — what would you do with these? BRIAN NORTON: Battery interrupters are really great for switches and things like that. What a battery interrupters will do is sit in a toy, let’s say, and sit between the battery and the contact between that toy. The toy will only work when the kid is pressing a switch that then actuates that connection between what’s inside the toy and the battery itself. It allows them to interact and see a cause and effect happening with toys and other types of things. BELVA SMITH: Kind of like those blocks that I just bought for my grandkids. BRIAN NORTON: Absolutely. That’s what a battery interrupter is. I know on Amazon, there are lots of options. If you look for copper discs, that’s kind of what I did, or copper stamping blanks, you can find lots of different options in terms of sizes, shapes. You can even get sheets of copper if you want and cut them to size, whatever you want them to be. But you would have to have a cutting device at that point. Lots of options for being able to purchase copper discs. Again, look for copper stamping blanks. Will be able to find some of that at Amazon. WADE WINGLER: But they are pretty cheap, right? WADE WINGLER: Not the disc, but you can buy a fully-made battery interrupter for $10 or so, right? BRIAN NORTON: Right. I think what he was wanting to do was make more durable ones and what he would be able to buy. If you go to inclusive TLC, you can find the actual ones you can buy in packages. BELVA SMITH: I think he was wanting his student to be able to do this. This was a project for his student. BRIAN NORTON: Right. There are some instructions. Instructables.com has some instructions for making battery interrupters. If you are also interested, either through Amazon, or you can go to Home Depot, you can buy a sheet of copper. BELVA SMITH: I wonder if you go to Home Depot and buy a sheet of copper — and I’ve done this when I’ve gone in and bought would. BRIAN NORTON: What they cut it for you? BELVA SMITH: Yeah. Because they will if you go in and buy a board and say I need this cut at whatever, they’ll cut it right there and then. JOSH ANDERSON: But you only get so many cuts for free, don’t you? BELVA SMITH: I don’t know. I’ve never gone over the number. From you should see all the custom stuff Belva has around her house your, I would like this sanded and stained. BELVA SMITH: It might be several trips. WADE WINGLER: I get the idea of wanting — this is a project for someone. I’m looking at the cost and looking at the complexity of finding the right size of disk, the right thickness, the right diameter and all that stuff. It may be a little bit tricky to make this a reasonable do-it-yourself project. By the time you have the switch interface and the wire and the solder and the copper. BELVA SMITH: It’s probably cheaper to just buy it. BRIAN NORTON: Do you know if the thickness has a play in that? I know you have to be able to fit between the battery and the contact. WADE WINGLER: It has to be thick enough that it interrupts the connection. You also have to have two copper discs. You have to have an insulator between them. If you just put a copper disk between a batter and a contact, you’ve just put another conductor. You have to have copper disk, a thick enough insulator that it’s going to break the circuit, and another copper disk on the other side. The discs are going to have to be thin enough that they physically fit, but also thick enough that they are going to conduct. There is a narrow parameter of the thickness of the copper. That’s why it’s tricky. And then if you’re going to cut them and make them round, you are probably not going to do that with tent snips or scissors. You are probably going to need to have some sort of a stamp or die or something like that. Yeah. No. [Laughter] I love your heart. I just don’t know that you can make it work in a way you are probably going to spend $20 a pop when making them when you can buy them for $10. I don’t know. I’m being a curmudgeon. But that’s where I am on it. BRIAN NORTON: Wade is a curmudgeon. We talked about inclusive TLC. You can buy battery switch adapters or interrupters for AA batteries or C and D batteries. Depending on what type of battery you are using, you’re going to get different sizes, different thickness and those types of things. For $13, you can buy one from inclusive TLC. I don’t know if it comes in a pack or is just one off. WADE WINGLER: You could probably get a volume discount if you want to buy a bunch of them. BELVA SMITH: I do see that he had two questions. His first question was where can you buy them, and his second one is what is the correct search term. BRIAN NORTON: Is that the other one I missed? BELVA SMITH: I think so. He wasn’t able to pull it up with what he was using. What’s your advice for his correct search term? BRIAN NORTON: The first place, as we’ve been talking, inclusive TLC sells premade ones for the different battery types. You might want to check that out. Or if you are looking and want to go to the process of trying to make them yourself, I would send you to Home Depot or to Amazon. I would look up copper stamping blanks. You can either get a sheet of copper and cut the circles yourself, or you can get them premade where they come in a pack of different sized discs. BRIAN NORTON: Our next question is, I am looking for adaptive eating utensils. I’ve heard of self-leveling spoons and automatic feeding systems. Can you tell me where I can find these kinds of aids for daily living? Any answers to that, folks? BELVA SMITH: You have several of them in here. BRIAN NORTON: I was going to let you guys jumping on that. BELVA SMITH: My generic answer would be Maxi Aids, is where I would start looking for daily living aids. WADE WINGLER: This is a classic Occupational Therapy thing. I don’t know the context of the question, of the person asking the question, if they’re in a school or a skilled care facility or whatever. But if you have occupational therapists in your world or nearby, ask them, because they probably either have somebody can look at or try. They probably have some favorites that they like. They can probably help you address some of the clinical need you are talking about and say, did you try this device with that device? We always try to put a plug in for the lending library as well. We have one here at Easter Seals. If you go to EasterSealsTech.com/library, you can see our library. Or if you are not in Indiana, you can go to EasterSealsTech.com/states and find your local lending library to try some of those. I know that we have several of those in our lending library and some we are aware of. Josh is going to talk about some of the specific ones. Check and see if you have an occupational therapist nearby where you can talk to them or check them out from your lending library. JOSH ANDERSON: I like how Wade volunteers me to do things. WADE WINGLER: I didn’t think you’re going to say anything. I’m setting you up. JOSH ANDERSON: There is a cool one that is new were called Obi that is a robot that is a full feeding system. We do not have that one in a library. JOSH ANDERSON: But if you go to their website, it says you can try it out from them for free. JOSH ANDERSON: That’s at trial.meetobi.com. Obi is O-B-I. it is a full on robot, so you don’t need to have any real range of motion in your arms or hands or anything like that. You don’t even need to grip a spoon. It would do all the work for you. WADE WINGLER: Can someone please make the Star Wars jokes so that I don’t sit here and wonder? JOSH ANDERSON: Go ahead. We are saving it for you. WADE WINGLER: Is it made by a guy named Wan Kenobi? JOSH ANDERSON: Yes, it is. Manufactured by the Wan Kenobi Organization. Anyway, I’m not sure how much that cost, but it is a robot so I assume it has a pretty decent sized price tag. But then there are all other kinds of self-leveling spoons. Liftware is a big one. Are they owned by Google, Brian? Or something like that? BRIAN NORTON: They were being promoted by Google a while back. I’m not sure if they are owned by Google or not. They do have some pretty nice options. They have something called Liftware Steady and Liftware Level. Liftware Steady is a spoon, so it’s not connected to anything. It’s a device made for hand tremors and allows utensil to check about 70 percent less than what your handshakes. If you do have tremors, it holds that spoon very steady as you pick up your food and try to eat it. The other one is Liftware Level. It’s made for folks who have limited hand and arm ability. It allows you — if you twist your arm, no matter what you do with her hand, the student will stay level. It does not turn upside down, does not move anywhere. It will actually bend and twist with the movements in your hand. Pretty interesting utensil. We’ve had a lot of interest in those for folks in the OT professing, as they work with folks and try to get them back home from the hospital and rehab facilities and those kinds of places. BELVA SMITH: How expensive is that? BRIAN NORTON: The Obi — I did look it up, is about $1,750. JOSH ANDERSON: That’s not bad for a robot. BRIAN NORTON: You can get the Liftware Steady and Liftware Level kits for around $195 apiece. BRIAN NORTON: That’s a great question. I don’t know if Philip would be something covered under waiver. I just don’t know. It would help you to be able to eat. JOSH ANDERSON: Durable medical equipment? BELVA SMITH: Yes, thank you. BRIAN NORTON: You can get swivel spoons. If you go to a place called CaregiverProducts.com. They have lots of different built up spoons. Those are the traditional types of utensils you’ll find where the handles are just built up so people can grip the more easily. Knives, forks, spoons, those sorts of things. This one basically swivels as you try to move it. It’s not robotic in the nature, like the Liftware Level spoon that they have, but this one does keep the speed level as well, if you will. It’s called the swivel spoon with built up handle. It’s about $30. Not as sophisticated as the other one but certainly could do the job for some folks. WADE WINGLER: On the Obi website, they have a category about reimbursement. It doesn’t say that these organizations will necessarily cover it, but they give you sample letters of medical necessity and all the documentation you might need to pursue funding. The categories they list our private insurance, Medicaid, state waiver programs, Veterans Administration, Workmen’s Comp., and school funding. That’s what Obi is thinking in terms of who might pay for this. BRIAN NORTON: Excellent. It’s an important topic. We all need to eat. Sometimes, based on what’s happening, if we have limited hand or arm ability, or tremors, that’s going to be difficult for folks. A couple of different options I’ll run through again. There’s Obi. There’s Liftware. There’s the Swivel Spoon that we talked about from Caregiver Products. But again, taking a look at MaxiAids, Sammons Preston would be another place, Caregiver Products would be another place to look that is out there. Most of what you’re going to find are just built up knives and spoons and other types of utensils like that, that help people get them better. But there are more sophisticated devices for the type of activity. BRIAN NORTON: Our next question is, I am hoping someone can help me with this. A friend’s mother has glioblastoma — hopefully I said that correctly — and is having difficulty with reading. Reportedly she can understand when something is read to her but is frustrated by her inability to read documents, etc. I was wondering if anyone had recommendations for text-to-speech app that will work on her iPhone so that maybe documents could be scanned in and read to her. They would do a lot for her spirits. Yes, the family is aware of the prognosis. Thank you, all. We talk about this a lot. BELVA SMITH: We do. I want to first say that all we can do is speak about our experiences. Obviously, what I would first say for this individual is they really should have a professional sit down with them into an evaluation. BELVA SMITH: One of the things I picked up from this is that this individual gets freshened with her inability to read the document. Though she may be able to hear it and comprehend it, hearing it is not the same as reading it. My first concern is to use the phone with such a small screen is probably going to be as frustrating then to just listen to it on the phone, because she is not going to be able to see it, more than likely. There are lots of ways that using the iPhone — or really — I’m just going to say the iPhone. I’m sure there are ways with the Android phones as well. KNFB is one of the apps that would be available, both iPhone or Android. That one is not free. I think it is free on Android — or it is for so many uses. JOSH ANDERSON: You get so many uses out of it. BELVA SMITH: And then you have to pay. It is half the cost that it is for the iPhone. It is the $99.99. Seeing AI is, by far, the one I would recommend, not just because it is free — yes, because it is free — but because it just works so easily. You also have to remember that this individual has to be able to capture that information, using this device. I can tell you, it’s my experience that for an individual who can’t see the document, getting the phone lifted in the right position, away from the printed information can be a challenge. JOSH ANDERSON: You brought up a good point. I was going to say some sort of stand. BELVA SMITH: I’ve got that in my answer. If you’re going to use the phone, I would highly encourage you to look for some sort of a stand. The one that is frequently used and pretty affordable is called the Scan Jig, that’s S-C-A-N J-I-G. On Amazon it’s just under $50. It’s a plastic device that allows you to set your phone down in the front part of it and scan your page in the back part of it so the distance is correct. However, recently I was with an individual and we were trying to use the scan jig with her phone. She had an 11 by 14 page. We were not able to capture it all. Just something to keep in mind. KNFB, Seeing AI are two the I have a lot of expense with and a lot of knowledge for both of them. I would encourage you — and Wade, you stole my thunder with the lending library because I was also going to say this is a perfect example of one a lending library would be a good place to go. Because there are so many different CCTV’s and handheld video magnifiers now that include OCR, which would probably be a more pleasurable experience if this individual would like to be able to feel like they are looking at the text and reading the text, to have it on a larger screen would probably be in trouble for them. I want to say that, as I finish up with the iPhone, the iPhone can be mirrored to a computer screen or a TV screen if you have an Apple TV. I believe the last I knew, you were still required to have an Apple TV. You can mirror the image that is on the phone to a larger screen. That would give you the feel for having — with the phone, at that is your option or your only option, that an Apple TV is like $150 and you could mirror it to the TV to give them the larger screen. Josh, what have you got? JOSH ANDERSON: You still every thing that I had. Except for I guess there is Envision AI. BELVA SMITH: I didn’t talk about Envision AI. Does anyone know why I didn’t talk about that one? BRIAN NORTON: No. Why didn’t you talk about that one? BELVA SMITH: Because you have to sign up to use it. And you have to log in to use it. Again, I’m thinking about a person who just wants to read the envelope. I don’t want to have to pick the phone up and login and use my password. I just want to open the phone and hit a button and get the information. Or better yet, with seeing AI, I just want to pick my phone up and hold it over the information and get it. Am I right? BELVA SMITH: I know you have to create an account, up but then you have to login every time you want to use it. WADE WINGLER: That’s how you know someone cares about you, if you have to log in. JOSH ANDERSON: They will do about the same thing as seeing AI, a lot of the same features, some of them I would say better on some, not as good at others. The difference is you do have to login because you only get to use it free so many times. BELVA SMITH: So if you are using voiceover, for example — I’m not even going to say that. I’m going to say for someone who is visually impaired, having to put in a username and password in order to get in the account is a challenge number one, and getting the information is challenge number two. JOSH ANDERSON: I have a hard time putting in a username and password. BELVA SMITH: Me too. I have the fattest thumbs on earth, I think. BRIAN NORTON: Mine automatically go in. I use last pass. BELVA SMITH: That’s one of the things I do like about iOS 12. Does anyone notice that you can just use your thumbprint? JOSH ANDERSON: My thumbprint puts all those in now. BELVA SMITH: I love it. [48:25] Wildcard question – type of tech do you bring on vacation with you and why? BRIAN NORTON: All right, so our next question is the wildcard question. This is where Wade asks us a question off-the-cuff. What have you got? WADE WINGLER: At the time we are recording this, we are in the middle of October. I don’t know about you guys, but I’m starting to have those conversations around my house about what are doing around the holidays? Where are you going? Are going to this person’s house or are they coming over or are we going to go on a trip? I know that there are probably a lot of people, especially in the US, who are starting to have those conversations. 10 or 15 years ago, I wouldn’t have thought about grabbing my fax machine off my desk or taking my computer off of my desk or grabbing a bunch of files or work related things to go on a family vacation. Now, when I think about family vacation, I don’t think about taking work with me either. I think about leaving work alone. But I still take technology with me when I go on a family vacation. It might be different if I’m going to the beach versus I’m going to my father-in-law’s house versus we are going to Disney or just thing at home. But I wondered, when it comes to holiday travel, what does the technology look like that you take with you? Do you leave everything at home? Or are you taking all the technology or some of your technology? And why? Because, again, you wouldn’t have taken fax machines and desktop computers years ago because that’s all about work. But technology is not just about work. What’s on your “To Pack” list when it comes to a holiday trip, whether you’re going on a vacation to the beach or staying with family? BELVA SMITH: That’s everything, right? BRIAN NORTON: That’s everything. Chargers. BRIAN NORTON: It all goes into my backpack. I talk about this all the time. I’m like Linus and his blanket. I need my backpack with me. It makes me feel secure. I’m just a little weird like that. I bring it all with me. With my phone, I’m using it as a GPS. I’m trying to figure out what’s around me when I’m down in a place on my familiar with. I got my laptop. I watch streaming TV. I have Hulu TV so I bring my laptop with me to watch to be wherever I go in case they don’t have the cable channel I want or what not. I have it on my laptop. I bring it all. BELVA SMITH: It seems like we have questions related to this a lot. For me, if I got my phone, I really have everything I need, except for being able to do some work related stuff. But if I’m going on vacation or I’m going on a holiday, I really don’t have to worry about being able to get into our database to do any billing. I don’t really have to worry about writing a report. But I guess it depends on what your occupation is, because maybe you really can’t afford to be away from your computer. But I feel like if I have my phone, I’ve got everything I need right there as far as my technology goes, because I can find out what’s around me, where I’m going, when I’m going to get there. I can shop if I need to, look up any information that I need, and track myself as I’m doing it. As long as I have my phone, I feel like I have everything. JOSH ANDERSON: I’m there with Belva. Really do I take my computer on vacation with me unless there is a project that just have to get done. If I do need to get on the computer, I know Brian has his so I can just email him from my phone and say can you look at this in the database. Pretty much anything else I can still do for my phone. I can still get emails, phone calls, even phone calls to the office will come through my email so I can still get those. I can get to them if I need to. I have fallen in love with the do not disturb feature on iPhone just because you set up a family and close friends as favorites, turn on do not disturb, and you will only get alerts from those folks. Sometimes on vacation that’s a very nice thing. I don’t do that, guys [fake cough]. That doesn’t turn on at 5 o’clock every evening. I promise. BELVA SMITH: For me, even doing my job, when I go in to see a consumer, I don’t always take my computer. In fact, I really take my computer. JOSH ANDERSON: I almost never do. BELVA SMITH: It’s going to be that I know, for whatever reason, I have to have my computer today. Otherwise I take my phone and thumb drive. And I’m good. JOSH ANDERSON: If I need to show them something, I’ll bring in the iPad. Or if I need to show them on the computer, I’ll bring it. BRIAN NORTON: Good point. I bring my iPad everywhere with me. BELVA SMITH: I have my watch on every day. WADE WINGLER: For me, it’s more. I’m like Brian. I have a backpack. In my backpack I have almost everything I need to do my job. I got my laptop. I got every possible Apple adapter that there is. I’ve got my iPad mini. When I’m going on vacation, I add more technology to it because I also through my Amazon Kindle, because I like to read. I don’t want to read on my phone and I don’t want to read on my iPad. I want to read on my Kindle because it doesn’t get text messages. I can just sit and read and have an electronic, but just a book in front of me for the period of time. I think most listeners know I use an insulin pump. I have type I diabetes. I’m also throwing in the stuff related to my insulin pump and charters and sensors and all that kind of stuff. For me, I’m adding additional technology. A follow-up question is do you guys take different technology if you’re going to a relatives for a few days versus you’re going on a trip where you’re going to be doing sightseeing or the beach or something like that? Or is it pretty much a vacation is a vacation and you take the same technology? JOSH ANDERSON: Same kinds of things. BRIAN NORTON: Everything is the same for me. BELVA SMITH: I think so. BRIAN NORTON: It’s all in my backpack. BRIAN NORTON: So that’s the end of our show. I want to make sure that you guys know how to send us questions. You can do that in a variety of ways. You can give us a call at our listener line which is 317-721-7124. You can send a tweet with hashtag ATFAQ. Or email us at tech@EasterSealsCrossroads.org. We definitely love to hear from you guys. In fact, without your questions, we really don’t have a show. Be a part of it. BELVA SMITH: Hey everybody, if you are a JAWS user or an NVDA user, send us a tweet or something and is no which one you are using and why you like it. BRIAN NORTON: That would be a great idea.